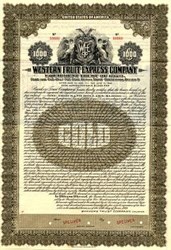 Beautiful engraved RARE specimen certificate from the Western Fruit Express Company dated in 1929. 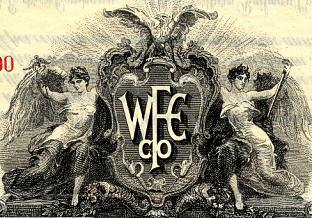 This historic document was printed by American Bank Note Company and has an ornate border around it with a vignette of two allegorical woman next to the company logo. This item is over 77 years old. Western Fruit Express (WFE) was a railroad refrigerator car leasing company formed by the Fruit Growers Express and the Great Northern Railway on July 18, 1923 in order to compete with the Pacific Fruit Express and Santa Fe Refrigerator Despatch in the Western United States. The arrangement added 3,000 cars to the FGE's existing equipment pool. The success of the WFE led to the creation of the Burlington Refrigerator Express (BREX) in May, 1926.